Snowdrops are fascinating little flowers; they are some of the only flowering plants that can grow in the freezing temperatures of January. To many, the little white buds also symbolise the coming of Spring. This makes them somewhat of a tourist attraction. 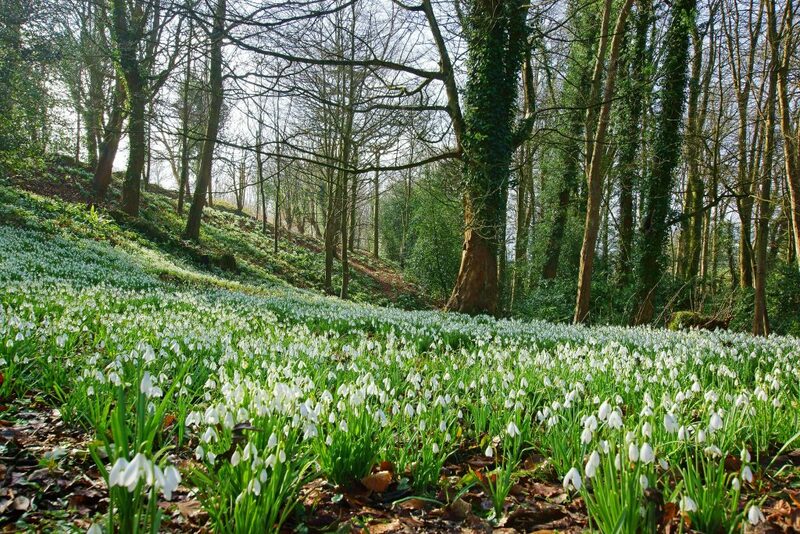 With that in mind, here are 3 of the best places to see snowdrops in Derbyshire. From Friday 1st February until Sunday 3rd March, Hopton Hall has a snowdrop walk for you to enjoy. Here, you can explore the 5 acres of woodland and gaze upon the tiny snowdrop flowers that cover the ground. After you’re done exploring, they also have a cosy cafe on site where you can have a bite to eat and a nice, warm drink. How perfect does that sound?! Beneath the yew trees of Hardwick Hall’s gardens, you can find little clusters of pure white snowdrop flowers. As the Hall’s website details, the snowdrops were originally planted in such a way that they spelt out the names of the 6th Duke’s nieces, although they have spread out too much now to be legible. Still, the story is quite touching and makes this area extra special. Rode Hall’s snowdrop walk is available to the public from February 2nd until March 3rd. To mark the event, they have prepared a special ‘snowdrop menu’ of warming soups and hearty bites, so there’s an extra something to look forward to during your visit. You can even bring your dog to this walk, so Rover doesn’t have to miss out. Will you make the trip to see snowdrops this winter? Although we only have 3 places on our list, there are many other places to see snowdrops in the Peak District if you look around. Why not come and see them for yourself? And whilst you’re on the search for the little white flowers, book a stay at one of our luxury holiday cottages. You’ll be able to scour the Peak District by day and enjoy luxury cosy, luxury accommodation by night. We also allow pets, so if you have a faithful companion, then they can come along, too! And pets stay free with us.